Shirlee’s Ultimate Women’s Gym is a proud sponsor of the 12th Annual Megan’s Wings 5K Run, which will be held Saturday, September 24, 2016 in McCarthy Park in Upland. 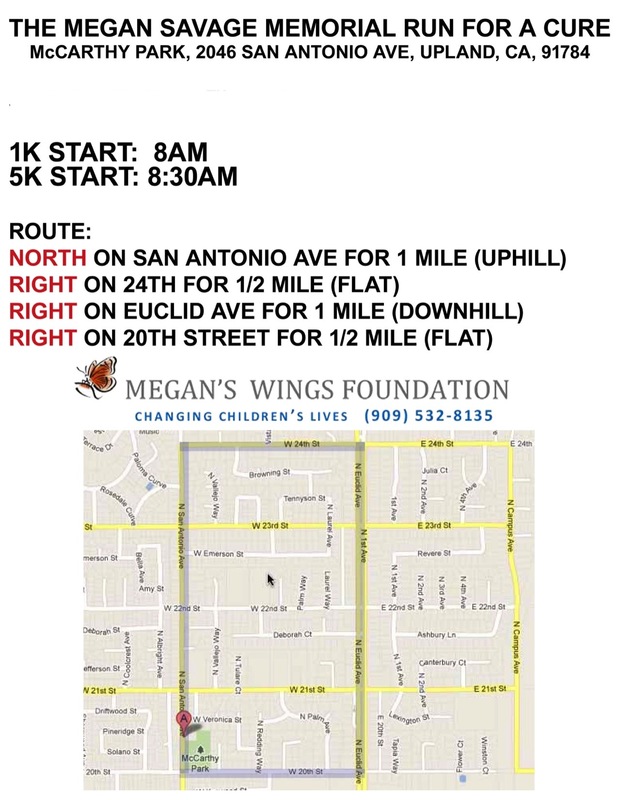 Megan’s Wings is a non profit dedicated to helping the families of local kids with cancer. To register for the event, visit meganswings.org. Participants can set up their own fundraising page on the site. The theme for this year is “Get Your Rock Star On!” and participants are encouraged to dress like a rock star. All proceeds from Megan’s Race help pay bills and temporary housing for childhood cancer families and support research to find better treatments and cures. Megan’s Wings is a 501c3 charity and all donations are 100% tax deductible. This entry was posted in News, ShirleeStrong and tagged 5h walk, Megan's Race Upland Sponsor, Megan's wings, Shirlees, Shirlees gym, Upland. Bookmark the permalink.